Willow…) V. blustery and cold outside, Rick puts heater on for morale and necessity (gloss sticky and drips more at zero degrees.) He’s being extra supportive and considerate today. Cups of tea. Funny to see penguins walking by the kitchen window. Oh but we’ve run out of water, (some of it has been tasting odd, like burnt fried food) so all four of us face the elements armed with ice axes, washing up bowls and shovels. The tide is up, so must dig down through snow overhang (risky) and fish out mini bergs blown into the bay. Some of the ice chunks are so huge that Tudor has to bash them with an axe on cardboard on the hall floor. Scoop up right-sized chunks and sweep up shards. Nearly finished reading ten years worth of wildlife reports. Helen makes bread. Tudor cooks dinner. Beer o’clock is early and the banter is coarse. V. fine kedgeree despite lack of tumeric, parsley etc. Lychees and chocolate mousse for pudding. Don’t we eat like royalty?! Play cribbage – first since we arrived – Rick and I neck and neck… I only win because my cards are scored before his. 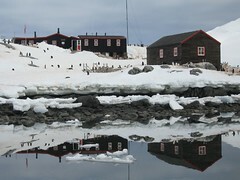 Then out to marvel at snow drifted penguins aarh. Grooving to Rolling Stones increases temperature, as does Jagermeister. Computer dead; woe is me. sorry to hear all our parcels are at the bottom of the icy ocean…there could be some interesting fossils in that mail bag in several million years time!